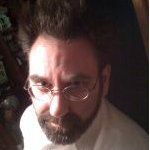 Previous Associate Fellow Andrew Kaiser is a composer and author based in Pittsburgh, PA. Kaiser is a member of the Moon Arts Group, and a founding member of the Deep Space Signaling Group along with Lowry Burgess. Kaiser’s work follows questions that resonate with a liturgical construct of deep space, mixing sonic analysis, psychogeography and electromagnetic sculpture. In the summer of 2010, Andrew presented a paper on Music as Cultural dialogue at the UNESCO “Forum on Cultural Rapprochement”, which included details of the activities of the Moon Arts group. He consulted with Squonk Opera for their latest work, Astrorama, a multimedia piece that addresses the human urge to reach into space presented as part of the recent Pittsburgh 250 celebration. Kaiser collaborated with Lowry Burgess to present music inspired by The Quiet Axis, a concert presented as part of an exhibition at the Carnegie Museum of Art in Pittsburgh: Kaiser completed an electronic composition based on digitally manipulated bells titled Music from a Place of Inseparable Emptiness and Luminosity, as well as the premiere of a string quartet. As an author, Kaiser has had articles published in Computer Music Journal, Leonardo Journal of Art and Science, and in an upcoming collection of essays entitled Between Worlds, to be released by MIT Press, also with Doug Vakoch of the SETI Institute. Kaiser’s work has been included in documentaries produced by the Canadian Broadcast Corporation (in a history of electronic music) and the BBC (on SETI, based on work with Doug Vakoch). He has presented papers on the Art and Science of Extra-terrestrial communication at workshops sponsored by the SETI institute, and at the Space Art conference held at the European Space Agency.